Readers of this page or the @BloomsburyPress twitterstream know that I think Mike Shatzkin is one of the smartest observers of the publishing industry today. I cite and retweet the posts from his Idea Logical blog so often that I sometimes feel I'm just a distribution service for him. So I'm perversely happy to report that I think one of his most recent posts grabbed completely the wrong end of the stick. His title says it all: "Marketing will replace editorial as the driving force behind publishing houses." Mike starts with a thumbnail history of the rise of sales departments in publishing, noting rightly that large sales forces and the tools they used--cover, catalogue, and the summary of key selling points we call title information sheets or tipsheets--were "critical factors to a book's success." I agree with Mike that as he has often written in other posts, the ability to put titles in front of readers simply by getting a lot of them on bookstore shelves has been for a long time the biggest "value added" by publishers for authors. The sheer scale of a big publisher's sales operation, its reach into the widest number of bookstores (or other outlets), was often its key competitive advantage. So far, I'm with him. And I'd largely agree with the next part of his history, which explains that as the marketplace changed (he points to e-books but in fact online bookselling was critical long before the e-book explosion), "selling"--getting books onto shelves--became only a part of the much broader effort to make consumers aware of a title and motivate them to buy it. Publicity, advertising, author branding, and nowadays an ever-evolving range of social media now outweigh wooing booksellers as critical parts of the process of delivering the author's work to readers. I concur with Mike that the "pull" function of motivating buyers has eclipsed the "push" function of bookstore sell-in in importance. I know we bloggers are supposed to make lists, so here's my list of 5 Reasons Editorial Still Drives Publishing. 1. First of all, as my old boss Tom McCormack used to say, "salepeople can't sell, marketers can't market, publicists can't publicize, until editors bring in the books." However the marketplace has changed, attracting and developing new works that people want to read is the sine qua non of a publishing house. Sales couldn't perform this function, nor can marketing. 2. The current explosion of self- and small publishers and the hugely expanding universe of titles available makes the role of a trusted curator that much more valuable. It's a cliché in the business that publishers' brands are meaningless to consumers. But with tens of thousands of new titles, mostly mediocre or worse, flooding the market, that is going to change. Houses whose editors consistently find works that readers respond to are going to have the most success. 3. The development of those works--that is, editing--is still a really vital part of what publishers offer authors. It's easy to romanticize, and overvalue, the mystical author-editor bond and the brilliant contributions of editors who turn sprawling stacks of manuscript into future classics. Such transformations are very rare; more often, the best an editor can do is take a book from a B plus to an A minus. Nonetheless, that might be what breaks that book out of the pack--there are a lot of B plus books out there. And whenever I meet with prospective authors and ask them what they're looking for in a publisher, the first thing most of them say is "an editor who will help me make my manuscript the best it can be." So the editing process is still a place where publishing houses truly do add value. 4. Most important, the best editors ARE marketers. To acquire and edit a book well, an editor needs to identify and understand the audience for that book, whether it's a poetic literary novel or a frat-boy memoir. Editors need to understand those potential readers and what they're going to respond to in a book; with more specialized content (say, history or science or cooking) they need to know something about the field. The editor has to articulate the "sales handle"--the reason why someone would part with $10, $25 or more to own this particular work. (That sense of the reader's interest is also critical in the editing process--the way you edit the book is shaped by what you intuit readers are looking for in it. So "marketing" and "editing" are not in fact separable.) All of this is what I meant above in saying that great publishers are driven by taste plus commercial savvy. Sometimes an inspired sales or marketing person, or a publicist, has a new inspiration for how to pitch or package a book, and often those colleagues will refine and sharpen the editor's take on it for their own purposes. But as my marketing colleagues will remind me, it's the editor who has to generate the passion and excitement that gets the machinery of the house moving. When editors don't do that, it's hard for marketers to manufacture that excitement themselves. 5. By the way, not only do editors need to know what readers in a given field are looking for. The best ones also find things that readers aren't looking for--yet. They recognize when an author has written something that doesn't fit an established template yet is fresh and compelling enough to create its own audience. It might be a first novel by David Foster Wallace, Art Spiegelman's Maus, or The Worst-Case Scenario Survival Handbook. Marketers are great at selling books to audiences they recognize, but usually very reluctant to embrace things they don't recognize. The first question marketing asks an editor with a new project is, "what are the comp titles?" When the answer is "there really aren't any" the editor meets stiff resistance. So a drawback of a "marketing-driven" house is likely to be that it follows trends rather than sets them--over the long term, a recipe for diminishing returns. Mike's column cites the example of a small publishing house where the head of marketing is also an acquiring editor and remarks, "I think many publishers will come to see the benefits of marketing-led acquisition in the years to come." But the fact that one smart, creative person with an editorial background has a marketing job doesn't mean that marketing is taking over editorial. In fact, it might be the reverse! There is no question that marketing is now more important, and more complex, than it has ever been in publishing, and it is likely to become even more so. But--and I say this with complete respect for the many superb marketing people I have worked with--as long as publishing houses as we know them exist, editors will remain at their heart. When I began working in publishing, one of my jobs was to read the slush pile--the stack of unsolicited book submissions that pour into the mailbox of any publishing house. In those pre-email days they poured physically through the mail slot in our office door, five days a week. As a young, optimistic eager beaver, I cheerfully tore open envelope after envelope, imagining I might find something brilliant inside. Many publishers back then had already declared they wouldn't accept unsolicited, unagented submissions, but I thought authors shouldn't be penalized just because they had not been able to find a literary agent. Perhaps I would find a work too original, too daring for the commercial-minded book peddlers to have picked it up, or discover a rustic genius who had banged out the great American novel at her kitchen table and sent it off to publishers without even knowing what agents were. After all, the tales of bestselling authors who have been discovered in the slush pile (such as Tom Clancy and Martha Grimes) were the stuff of industry legend. I was rapidly disillusioned. Of course, I had expected that 90 percent of what was in the slush pile would be unpublishable--and so it was. The many, many ways in which slush can be unpublishable are fodder for much editorial-department humor, but my point here is not to shoot the fish in that particular barrel. What I came to realize is that the task of approaching a publisher is a useful test of common sense and some of the basic skills required for authorship. Writing a book demands the ability to do probably some kind of research; to string a sequence of coherent paragraphs together focused around a central idea; and to have some idea of what the sort of person who's likely to read your work will be looking for in it. This is not in the least to suggest I don't recognize how challenging it can be to find a publisher, even for a very good book. I have both respect and sympathy for anyone setting out on that quest. What I'm saying is this: If you are thoughtful and imaginative enough to write a first-rate novel, say, or a gripping historical narrative, you should be able to apply those skills to the process of putting your work in front of an editor. You should not just chuck your query letter into a mailbox addressed to "Editorial Department, Random House" or "To Whom It May Concern". Rather than just sending your stuff to every house in the Literary Market Place from Abbeville to Zebra Publishing, you should find out whether the publisher you're querying even has fiction, or children's books, or whatever, on its list. You would not believe how often my imprint, which states on its webpage it publishes NONFICTION, receives queries from novelists. If you have a little more common sense and a bit more enterprise, you can probably figure out that it makes sense to query publishers who have been successful with the sort of book you're writing; take it one step further, and you can track down the name of an editor who worked on such a book. I am always receptive to a letter from an author who says, "I'm writing a book that I think will appeal to readers of XYZ Title and I saw that you edited it." But by definition, writers in the slush pile have not taken these elementary steps. They have not gone through the thought process, or done the legwork, necessary to put a well-targeted pitch into the mailbox of a specific person, they have trusted to luck or perhaps the dazzling quality of their work, or they simply haven't thought about it one way or the other. That doesn't mean they aren't gifted; maybe they are naive, untutored geniuses. But it does mean they're not professionals. They aren't thinking about their work or their careers in a businesslike way. 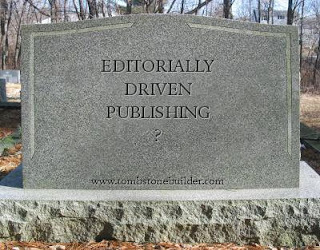 And that simply means the odds that they can be successfully published are really slim. I don't mean this snidely. Creativity being what it is, it's always the case that there are talented writers out there who are totally naive about what might be involved in getting your work published. And once I even found a pretty talented mystery writer in the slush pile, who went on to write several books. That was one author, though, out of the hundreds and hundreds I sifted through--meaning it wasn't 90 percent, but well over 99.9 percent, whose work had not been viable. Given the state of the marketplace, where it seems to take more effort than ever--by both publisher and author--to make a book work, I've had to conclude that the time I might devote to panning the slush pile for gold nuggets is that much less time that I have to spend on all my other tasks. The 21st century cousin of the slush-pile submission is the query-by-tweet. Not only do we get "Dear Editor" letters, we see messages like this on Twitter. Hey, @BloomsburyPress, I've written a teen paranormal romance. Ppl say it's next TWILIGHT-DM me for details! After seeing one too many of those, I tweeted in response, Dear Authors: Twitter is not the way to query us. And this imprint is nonfiction only. If you want to get published, please do yr homework. Instantly--this being Twitter--I received a stream of tweets disparaging Bloomsbury Press as arrogant and ignorant of the new world where "publishers need to impress and adapt, not writers. We have other avenues." Now, I celebrate the fact that authors have many ways of reaching readers. Yet as in any other form of writing, it's important to suit your content to the medium. Twitter, a medium of 140-character blurts, is not a good showcase for your ability to write a work of 70,000 words-plus. And since even our Twitter profile says @BloomsburyPress is a publisher of "140+char serious nonfiction," an author who queries us about his YA novel has failed to clear even a pretty minimal threshold of effort. My abovementioned tweet was not intended to disparage or discourage authors, but to offer straightforward, good-faith advice. Twitter is a great tool for authors--but so was the telephone. Neither of them are the right tool for finding a publisher.